Provides easy installation with a minimum of piping, and electrical connections. Provides reliability and unit responsibility. Installation is available within the Greater Sacramento area. Control Panels with UL listed components contain standard features such as H-O-A selector switches, control transformers, fusible disconnects, NEMA size magnetic starters and adjustable overload devices. Complies with NEC to provide safe installation work environments. Start up and training of personnel is provided for all systems. Controls for pumping operation can be floats, pressure, flow, or manual. Grooved pipe and fittings for reduced water hammer and surge damage and noise, easier servicing for future repairs or changes. Electric Motors available three-phase 208-230/460 volt, or single phase 115/230-volt or special voltage upon request. Valves for isolation and bypass to allow maintenance of pumps without shutting down the system. Valves can be grooved, flanged or threaded. System Suction and Discharge Gauges. Allowing maintenance personnel to monitor system operation. Enclosures for weather and vandal protection. Two piece, 14 and 16 gauge steel, size 48”x36”x40”x38” with slanted roof, hinged front panel for service access, louvered sides, all steel brackets, lockable in closed and open position and powder coat dark green. Note the inlet and outlet are located on one end for easier connection with the mainline. Hydropneumatic tanks to deliver water to the demand when low flows are needed without the pump running. Custom Panel Options: Control Panels with UL listed components can include controls for low pressure, alternation for multiple pump systems, PLC for custom logic systems. Assemblies: Custom designed and constructed skid mounts for indoor or fenced locations. Mounting pumps, panels, plumbing, valves to a common steel frame for ease of connection to the plumbing and electrical system. 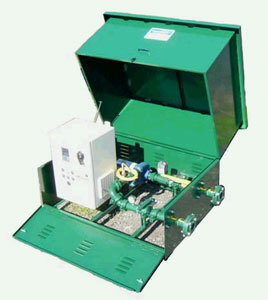 Combination pump and reduced pressure devices (RP) with expanded metal and clam shell design. Built with angle-iron frame #9 expanded metal. Valve System: Bypass can be fitted with a check valve for ease of water flow through the bypass when pump is not running. Switches: FM Efector flow switch for AC supply to operate pump while water is in motion through the switch. Field adjustable set point and can be supplied with VFD or magnetic starter. Global Water Float switch to control water level in a pond. Can maintain level to 3” +/- with a PLC to receive signal for control. Major pump manufactures such as Goulds, Paco, Berkeley, Grundfos, Sta-Rite, Peerless, Grundfos, Goulds, Berkeley, Jacuzzi.